Don't underestimate how much holiday dorm room decorating will do for your college dorm room! You obviously want your college dorm room to be as comfortable as can be. Part of making your college dorm room super comfortable is by doing some simple dorm room decorating for the holidays. Decorating for the holidays will make your college dorm room feel quite a bit more home-like. After all, when you think of your family's home, you probably think of hot chocolate, college blankets, and plenty of dorm room decorations for Christmas. You can bring those same comfortable feelings to your college dorm room decor with our Mocha Laser Dorm Christmas Tree! 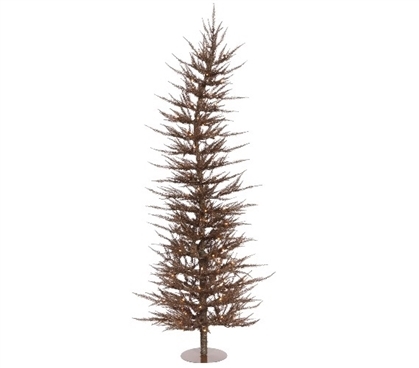 Our Mocha Laser Dorm Christmas Tree has rich chocolate tints for the branches and trunk. This neutrality will allow you to really make your other dorm essentials for your holiday decorations stand out. You can add pink, blue, or even silver to the branches of this college supplies item and can rest assured that it will look great. With clear mini dorm lights already attached to this dorm necessities item, all you have to do is add some garland and dorm Christmas bulbs to the branches for a complete look to your dorm room decor.